Proteins are the most abundant macromolecules in cells and account for more than 50 percent of their dry weight. They are found in all cells and in all their constituent parts. Furthermore, proteins perform many different biological roles as they are the molecular instruments by which the genetic information is expressed. The key to the structure of the thousands of different proteins is provided by the group of relatively simple building block molecules from which the proteins are built. All proteins, from those found in the oldest bacteria to those found in higher life forms, are built from the same group of covalently bound 20 amino acids, giving rise to characteristic sequences. As each of these amino acids has a slightly different chain, which gives it its chemical individuality, this group of 20 building block molecules can be viewed as the alphabet of the protein structure. When a small number of amino acids bind together, this produces a peptide; if the number of amino acids forming the molecule is not greater than 10, it is called an oligopeptide (dipeptides, tripeptides, etc. ), if it is greater than 10, it is called a polypeptide, and if the number is greater than 50 amino acids, it is called a protein. Thus, peptides are short chains composed of two or more covalently bound amino acids while proteins are composed of polypeptides and are very long chains consisting of a large number of amino acids. 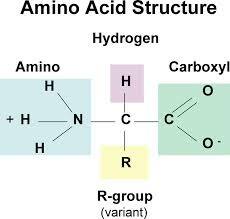 Proteins differ from each other because each one has a different sequence of its amino acid units. The amino acids are the alphabet of the protein structure as they can be arranged in an almost infinite number of sequences, giving rise to an almost infinite number of different proteins. Chemical bodies that possess an “amino” group and an “acid” group. As they have an alkaline group and an acid group, they can behave as an acid or an alkali, depending on the pH of the solution in which they are contained. They are soluble in water, colorless and crystallisable. About 100 different amino acids are known, but only 20 are natural protein components. The rest are known as non-proteic amino acids as they are not found in proteins. All living species are capable of synthesizing their own proteins from amino acids. The higher plants also synthesize all the amino acids they need while animals need their diet to obtain the amino acids that are necessary for life. Joining the acid group of one amino acid and the amino group of another, amino acids are bound by means of the peptide bridge, forming the socalled peptides. As has been explained above, when several peptides join to form a short chain, they are called oligopeptides (dipeptides, tripeptides, etc. ), and these join to form polypeptides, which in turn make up the protein molecules. Following a reverse process, proteins can be broken down into peptides and these in turn into amino acids by means of a process called hydrolysis. Plants are able to synthesize amino acids from nitric or ammonic nitrogen, which they find in the soil. This synthesis entails a considerable energy expenditure. ALL amino acids synthesized by living beings are in the “L” (levorotatory) form and they can only be useful in that form in plants and other living beings. The so-called “D” (dextrorotatory) forms are not usable for plant nutrition. It is possible to supply amino acids to the plant so that it can save energy in synthesizing them, thus obtaining a better and faster response from the plant being grown. By this means, amino acids are rapidly taken up by the plants and immediately transported to the growth points. However, the quality of an amino acid-based product is directly related with the obtainment method used. The easiest way to obtain amino acids that are useful for agriculture is by protein hydrolysis, breaking the peptide bridges by which the various amino acids are joined together. Hydrolysis gives amino acid chains or short chain and free (single) amino acids. It is the latter that can be used most beneficially by plants.The better the hydrolysis process is, the more free amino acids and short-chain oligopeptides will be obtained, with less long-chain polypeptides. This hydrolysis process can be carried out using acids, i.e., chemical hydrolysis, which continues to be one of the most popular forms of protein modification and can be performed in acid or alkaline conditions. Acid hydrolysis with hydrochloric (HCl) or sulfuric acid is the most commonly used hydrolysis method. There are many articles that provide detailed descriptions of the different methods and the conditions applied for each one. The conditions applied in most cases cause significant changes in the amino acid profile of the substrate to be hydrolyzed. Under these conditions, for example, asparagines and glutamine are fully hydrolysed to aspartic acid and glutamic acid, respectively; tryptophan is destroyed; cysteine cannot be determined; tyrosine is partially destroyed, and serine and threonine are partially hydrolysed. Alkaline hydrolysis is used if the protein sample contains a high percentage of carbohydrates but causes reactions that may be undesirable for use in nutrition. The biggest drawback of this method is that it destroys serine, threonine, arginine and cysteine, and produces racemization of the L-isomers of all amino acids to their D-analogues. The exposure of food proteins to certain processing conditions such as those that take place during chemical hydrolysis, induces different chemical changes. One of them is the racemization of all L-amino acids to their D-isomers. The racemization of the L-amino acids in proteins depends on the pH, time and temperature. The presence of D-amino acid residues in the protein chain reduces its digestibility and nutritional quality. Enzymatic hydrolysis uses enzymes. 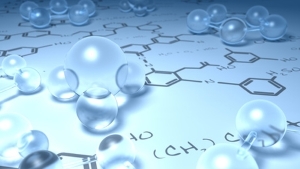 Enzymes offer advantages that include efficient control of the hydrolysis process, fast reaction speed, gentle hydrolysis conditions and high specificity. Although more expensive, this hydrolysis process is gentler and more natural than chemical hydrolysis and guarantees that all the amino acids obtained are in the “L” (levorotatory) form, which is the only form that plants can effectively utilize and assimilate. We use enzymatic hydrolysis to extract the active ingredients in AminoA Products from a variety of protein sources. This ensures that all amino acids in AminoA products are of the L type.